As I have mentioned, I own a lot of products from The Body Shop. 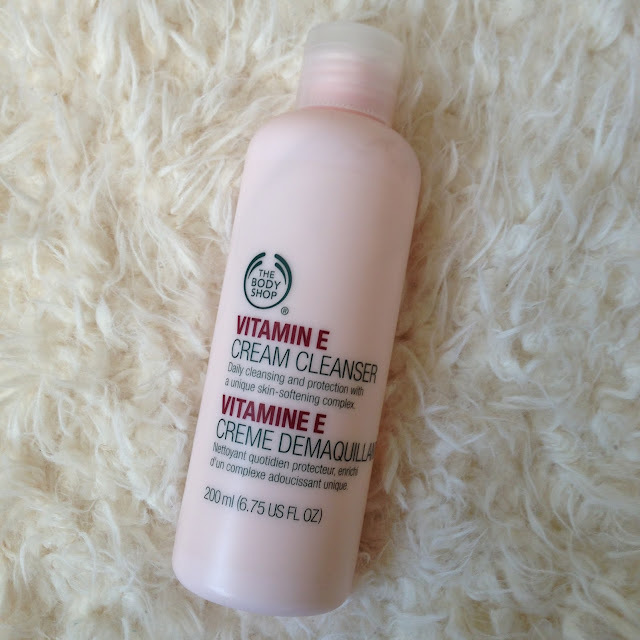 One of my favourites recently is this product, the Vitamin E Cream cleanser. There are so many cleansers, make up removers and toners on the market, most of which have a premium price tag or are absolutely awful. However, this cleanser is fantastic and affordable. I have also bought The Body Shop Camomile Gentle Eye Make up Remover for years and alternate between the two, so check that out too if you prefer liquid make up removers to creams. I always preferred liquids and felt strange putting creams near my eyes for a long time, but after getting used to using a cream cleanser, I have totally converted. The product takes off all traces of eye and face make up easily and gently, leaving your eyes looking brighter and fresher. I always found that make up removers from the drug stores always left my eyes looking dark and shadowed and I would spend ages scrubbing at my mascara. Yet, with this product, it doesn’t cost the earth and gives you beautiful and completely clean skin. The toner in the range is also fantastic and I would recommend trying the two as a pair. You will find you go through the cleanser much faster than the toner however, so make sure you keep stocking up. So, what else? It is really kind on the eyes and doesn’t sting like some products can. It also has a really clean and fresh scent. The product comes in a 200ml bottle and will probably last you around a month and half with daily use. I just tip about two pea size amounts onto a cotton pad and gently sweep over the eyes, without dragging the skin too harshly but whilst still applying enough pressure to remove all signs of make up. I then add another 2 pea size amounts onto the opposite side of the pad and wipe away my other eye. If you’re looking for an affordable alternative to the designer brand cleansers, but for something that really gently removes all signs of make up and leaves your skin feeling rejuvenated, I highly recommend this to you! It really is worth it. Do you know of any cleansers better than this one?